Local newspapers and radio stations may sometimes give small tips on how to prepare for a hurricane but really being prepared means not only stocking up on extra water but having an emergency kit, evacuation plan and knowing what to expect and do after a hurricane as well as knowing how to get compensation for property damage. Visitors to and residents of Florida ought to know by now that having supplies on hand in advance of a hurricane is crucial. Whether you are in Miami, Fort Lauderdale, Sarasota or even Orlando it is important to stock up on essentials early. This means not only stockpiling bottles of water but canned foods and gas as well. Remember you not only have to survive through the days of the actual hurricane it’s self but the aftermath and possibly weeks without electricity, running water and stores. If you wait till there is an imminent warning or an evacuation order you could find that you do not have the cash on hand to get the items that you need or that stores are sold out and even that prices are much higher. Emergencies kits are also essential for all Floridians, especially those in Miami-Dade, Broward, Palm Beach, Collier, Lee and Sarasota counties. An emergency kit is also useful for any other type of disaster or emergency situation that may arise as well. This should be a bag or back pack that is already packed and within easy reach to be able to grab in the case you have to evacuate or are hit by a hurricane or tornado. It should include water and food as well as first aid supplies, something to protect you from the elements and supplies to help you survive through a lack of electricity and shelter for at least several days. Everyone in your household should have their own. 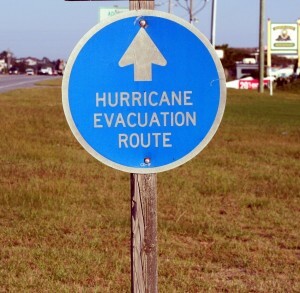 Evacuations are common during hurricane season in Florida especially for those living in coastal areas and in close proximity to the Atlantic or Gulf. Evacuations can be mayhem and are usually mandatory so be prepared. While you may have seen the occasional evacuation route sign they are hardly something you are going to remember in an emergency situation. Make sure you know the best ways to evacuate the area you live in and have a back up route as well. After the devastation of Katrina it is also obvious that staying in state provided shelters can not only be uncomfortable but dangerous as well. So it is much wiser to have money set aside and a plan for somewhere to escape to for at least several days and possibly weeks in case your home is in the direct path of a Florida hurricane. Also keep in mind that gas will be scarce and you may have to drive at least several hundred miles to find gas to keep you going. Preparing your home for a hurricane in Florida is just as important as preparing yourself. The more you can do to protect your property the better. Even if you have insurance, keep in mind that insurance companies following hurricanes will try to delay payouts and that you will have to suffer with the condition of your home until it can be repaired which can be many months or even years in some cases due to contractors being overwhelmed with work. This means trimming trees and removing debris that could turn into projectiles during a storm.